The exciting third book in the series. The orphan children of the late chieftain, Sten Brightsword, have been banished from their island home after they disobeyed the instruction of the “Ting”, the island parliament. In order to be allowed to return they must bring with them a warrior’s helmet filled with silver. The brother and sister, Ahl who is now seventeen and Ingir who is a year older, get the help of the Governor of a town in northern Russia after Ingir becomes engaged to the Governor’s son. But things go wrong for them when the town is threatened by an attack from enemies. They escape south and after many adventures Ahl and his crew reach Constantinople. At last things look better for them when the Emperor offers them work which is so highly paid that they must surely earn enough silver bounty to fill a helmet. Available to order from SilverWood Books and Amazon. Children of the Chieftain: Bounty is the third installment in this excellent Viking series which is aimed at young readers. When I was ten or eleven I loved reading historical adventure stories and I am sure that if the Children of the Chieftain books had been around at that time I would have devoured them just as eagerly as I did the work of Alan Garner and Leon Garfield. I’ve followed this series from the beginning and have seen both the story telling and the characters grow in confidence, and as each story comes along there is a clever continuance of the historical adventure which unfolds in every story. In The Children of the Chieftain: Bounty the young crew of the Viking ship, Eagle set off on a new adventure, on a journey which will take them to new and exciting places, and which will be fraught with danger and cruel mischance. As always the author writes a really good, rollicking adventure and never compromises on accurate description nor does he patronise his young readers by omitting the dangerous aspects of this time in history. The historical research is as ever impeccably achieved and there is a real feeling of authenticity to the story which those who have read the series from the beginning will recognise as typical of this author’s fine attention to detail. 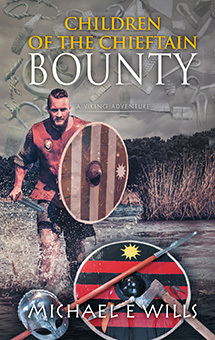 Whilst Bounty may be read as a standalone historical adventure, as always, my advice is to read any series from the start, as that way you notice the progression, and the story becomes far more meaningful when you become emotionally invested in the characters. For younger readers who may struggle with some of the terminology, or even for adults like me who may need some clarification, there is a helpful word explanation at the end of the book. At the start of this Viking adventure I was informed that it was to be a trilogy of work, I am especially pleased to find that there is now to be a fourth book, The Children of the Chieftain: Bound for Home which will oversee the conclusion. Most certainly the ending of Bounty lends itself to even more adventures in the final conclusion.